At Salt Lake Dental Care – Clint Blackwood DDS, we make a conscious effort to help our patients feel comfortable. Though our chairs are cushy as can be, we are not talking about physical comfort here. We are talking about emotional comfort. In other words, peace of mind. 1. We don’t judge you. Dr. Clint Blackwood has devoted a professional career to promoting oral health and creating beautiful smiles. The understanding dental team at Salt Lake Dental Care – Clint Blackwood DDS is here to help you, regardless of the state of your teeth. We have treated patients with severe tooth neglect, advanced gum disease, enamel erosion caused by eating disorders, tooth damage caused by illegal drug use, baby bottle tooth decay, tobacco-stained teeth: basically, every imaginable dental problem. We don’t live in a bubble. We understand and empathize with our patients. 2. We protect you from pain. From topical analgesics to oral conscious sedation, we will eliminate or minimize pain as best we can. Dr. Blackwood is a pro at administering barely noticeable injections. 3. We help you with your dental anxiety. Fear of the dentist is far more common than you might realize and certainly nothing to be ashamed of. The perceived loss of control, instruments poking in your mouth, and teeth being worked on is not pleasant. Some patients get claustrophobic because they need to lie still in the chair for treatment. Sleep dentistry (oral conscious sedation) not only aids in pain management, it allows you to sleep through your appointment. There are different levels of sedation, so you don’t have to be completely unconscious unless you want to be. If you would like more information about sedation, call 801-938-8855 to schedule a consultation. We can consider the different levels of oral conscious sedation so you can settle upon the one that is best for you. 4. We communicate with you. Dr. Blackwood has established a reputation as an effective and helpful communicator. Procedures are thoroughly explained and all your critical questions will be answered prior to treatment. If you are not sure you want to initiate treatment, we are happy to let you think about it for a while. There is no rush. 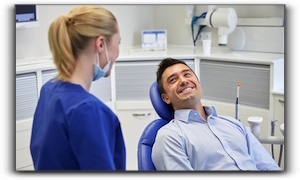 If you have postponed dental treatment for any reason, we encourage you to give Dr. Blackwood and the team at Salt Lake Dental Care – Clint Blackwood DDS a try. Neglecting your oral health has serious consequences. Call today to schedule an appointment. We look forward to meeting you.